The most hazardous portion of any flight is takeoff and landing, whether you're flying a commercial aircraft or a hobby drone. During landing, the pilot has already reduced engine power and may not have time to increase speed. During take-off, an aircraft is near stall speed. Knowledge of how wind shear affects performance can be essential to a successful recovery maneuver following a wind shear encounter. Wind shear that improves performance will be first indicated in the cockpit by increased airspeed. Pilot reaction—reduce thrust. With power back, the pilot will experience a shear in the reverse, decreasing airspeed and degrading vertical flight path performance. When flying through a temperature inversion, expect both directional and speed wind shear. This applies to all aircraft! If an attempt is made to regain lost speed by lowering the nose, the combination of decreasing airspeed and pitch altitude produces a high rate of descent. In some circumstances, as little as 5 seconds may be available to recognize and react to a degrading vertical flight path. Wind shear is a generic term referring to any rapidly changing wind currents. It describes a change in wind speed and/or wind direction in a short distance, resulting in a tearing or shearing effect. Wind shear can be encountered when flying through a temperature inversion layer. It can exist in a horizontal or vertical direction and occasionally in both. 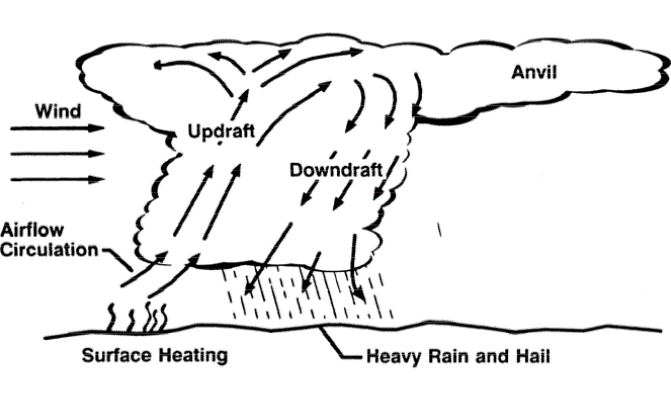 Vertical wind shear is the rate of change of the wind with respect to altitude. Horizontal wind shear is the rate of change on a horizontal plane. AC 00-54 Severe Wind shear: A rapid change in wind direction or velocity causing airspeed changes greater than 15 knots or vertical speed changes greater than 500 feet per minute. This entry was posted in All Industries and tagged Drone Take-Off & Landing.